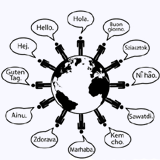 In Anda Sprachschule we offer a complete translation service to the languages we teach in the school: Spanish, German, English, Italian and Französisch.. Given the fact that we are a specialized language school, we who work here are language specialists and we have the expertise and knowledge required to translate the documents the client entrust us. We offer idiomatic services for people, institutions or companies. We correct, edit and translate texts of all sorts: personal (any kind of text you wish to have in another language), commercial (letters, reports), advertising (brochures, touristic guides), specialized or technical (IT manuals, technical books), or websites. If you haven’t worked with us yet, fill out the next application form and we will get back to you with a budget as soon as possible.